Antonio Vivaldi was a virtuoso violinist, a virtuoso composer – at least in terms of quantity – and a virtuoso teacher, as clearly evidenced by the level of competence attained by his pupils. A Venetian all his life, travelling but always returning, Vivaldi epitomizes Italian Baroque Music like no other composer. But first, let us look briefly at Vivaldi's home City-State. Situated on 120 islands formed by 177 canals in the lagoon between the mouths of the Po and Piave rivers at the northern extremity of the Adriatic Sea, Venice became known as the “Queen of the Adriatic” reflecting its historic role as a naval power and commercial centre. The Crusades and the resulting development of trade with Asia and the Middle East led to the establishment of Venice as the greatest commercial centre for trade with the East and politically the strongest European power in the Mediterranean region. Governed effectively by its wealthy merchants with a focus on trade, Venice prospered; the great houses, palaces, public buildings and statuary we enjoy today are the legacy of aristocratic wealth. Having put down its main rival, Genoa, in the war of 1378-1381, Venice established its supremacy over the Adriatic, its 'home waters', and the northern Mediterranean. Further wars of conquest enabled Venice to acquire neighbouring territories, and by the late 15th century, the city-state was the leading maritime power in the Christian world. Travel up and down the Croatian coast to see evidence everywhere of Venetian architecture, statues and city planning. But by the mid 1600s Venice was losing its commercial power, as new trading routes opened, and new power structures developed in the Mediterranean. So Venice, undeterred, opened itself up to the newly travelling aristocracy as a tourist centre, with its Masqued Carnivals and Splendiferous Canal Processions set against the backdrop of its unique location and architecture. In 1668, "An Italian Voyage" by Richard Lassels was published, and the institution of the Grand Tour of Europe was born. The Grand Tourist was typically a young man with a thorough grounding in Greek and Latin literature as well as leisure time, financial means, and some interest in art. London was a frequent starting point for Grand Tourists, and Paris a compulsory destination; many travelled to the Netherlands, some to Switzerland and Germany, and a very few adventurers to Spain, Greece, or Turkey. The essential place to visit, however, was Italy. The British traveller Charles Thompson speaks for many Grand Tourists when he describes himself as "being impatiently desirous of viewing a country so famous in history, which once gave laws to the world; which is at present the greatest school of music and painting, contains the noblest productions of statuary and architecture, and abounds with cabinets of rarities, and collections of all kinds of antiquities." Domestic music making among the wealthier families was a popular and highly prized art, and for many Grand Tourists the celebrated virtuosi, the concerts and compositions of baroque masters especially in Italy would have been a major focus of their travels. They would also bring back music scores or hand-written copies of the latest Italian compositions. Within Italy, the great focus was Rome, whose ancient ruins and more recent achievements were shown to every Grand Tourist. Here too, it may be said that baroque music was born. During the first half of the 1700s, baroque music adopted the Italian forms of the concerto and sonata, and with them, much of the Italian baroque "vocabulary" together with the latest Italian compositions. In the north, Venice was also recognized as a great music centre both for its concerts and its operatic traditions. The violin was especially prized among Venetian composers, perhaps due to the proximity of eminent violin makers and families such as Amati and Stradivarius. A fortuitous background indeed, into which Antonio Vivaldi was born in Venice on March 4th, 1678. Though ordained a priest in 1703, according to his own account, within a year of being ordained Vivaldi no longer wished to celebrate mass because of physical complaints ("tightness of the chest") which pointed to angina pectoris, asthmatic bronchitis, or a nervous disorder. It is also possible that Vivaldi was simulating illness - there is a story that he sometimes left the altar in order to quickly jot down a musical idea in the sacristy.... In any event he had become a priest against his own will, perhaps because in his day training for the priesthood was often the only possible way for a poor family to obtain free schooling. In the event however, he was destined for a life of music, as he was employed for most of his working life by the Ospedale della Pietà, beginning right after his ordination in 1703, when he was appointed as violin teacher. The reputation of baroque Venice as a musical centre was one of the highest in Europe, due largely to its four conservatories of music. Beginning as charitable foundations they developed gradually as seats of musical learning, and by the early 1700s their excellence was unrivalled. This was confirmed by Charles de Brosses, French Magistrate and President of the Parlement de Dijon, who visited Italy in 1739, reporting in his Lettres familières écrites d'Italie and published posthumously in 1799, that "the Ospedali have the best music here. There are four of them, all for illegitimate or orphaned girls whose parents cannot support them. These are brought up at the State's expense and trained exclusively in music. Indeed they sing like angels, play the violin, flute, organ, oboe, cello, bassoon... The performances are entirely their own and each concert is composed of about forty girls." The Ospedale della Pietà however, where Vivaldi was employed for most of his working life as violin teacher and composer, stood above the rest. Often termed an "orphanage", this Ospedale was in fact a home for the female offspring of noblemen and their numerous dalliances with their mistresses. The Ospedale was thus well endowed by the "anonymous" fathers; its furnishings bordered on the opulent, the young ladies were well looked-after, and the musical standards among the highest in Venice. Though Vivaldi composed many fine and memorable concertos, such as the Four Seasons and the Opus 3 for example, he also wrote many works which sound like exercises for students. And this is precisely what they were. Many of Vivaldi's concerti were indeed exercises which he would play with his many talented pupils. And the listener can only be impressed by the high technical standard they demand and imply. Indeed the Ospedale's orchestra was highly respected and in frequent demand for concerts outside the Ospedale. Until 1709, Vivaldi's appointment with the Ospedale was renewed every year and again after 1711. Between 1709 and 1711 was not attached to the Ospedale; perhaps in this period he was already working for the Teatro Sant' Angelo, an opera theatre. He also became active as a composer - in 1711 twelve concertos he had written were published in Amsterdam by the music publisher Estienne Roger under the title l'Estro armonico (Harmonic Inspiration). While maintaining his relationship with the Ospedale, Vivaldi also had a great interest in opera. In 1713 he was given a month's leave from the Ospedale in order to stage his first opera, Ottone in villa, in Vicenza. In the 1713-4 season he produced an opera by the composer Giovanni Alberto Rostori (1692-1753) for the Teatro Sant' Angelo. At the end of 1717 Vivaldi moved to Mantua for two years in order to take up a post as Chamber Capellmeister at the court of Landgrave Philip van Hessen-Darmstadt. His task there was to provide operas, cantatas, and perhaps concert music, too. His opera Armida had already been performed earlier in Mantua and in 1719 Teuzzone and Tito Manlio followed. On the score of the latter are the words: "music by Vivaldi, made in 5 days." In 1720 La Conduce o siano Li veri amici was also performed. In 172O Vivaldi returned to Venice where he again staged new operas written by himself in the Teatro Sant' Angelo. In Mantua he had made the acquaintance of the singer Anna Giraud (or Giro), who had moved in to live with him. Vivaldi maintained that she was no more than a housekeeper and good friend, just like Anna's sister, Paolina, who also shared his house. In his Memoirs, the Italian playwright Carlo Goldoni gave the following portrait of Vivaldi and Giraud: "This priest, an excellent violinist but a mediocre composer, has trained Miss Giraud to be a singer. She was young, born in Venice, but the daughter of a French wigmaker. She was not beautiful, though she was elegant, small in stature, with beautiful eyes and a fascinating mouth. She had a small voice, but many languages in which to harangue." Vivaldi stayed together with her until his death. During the early 1720s Vivaldi was also active in Rome, where he found a patron in the person of Cardinal Pietro Ottoboni, a great music lover, who earlier had been the patron of Arcangelo Corelli. And if we can believe Vivaldi himself, the Pope asked him to come and play the violin for him at a private audience. Vivaldi also wrote works on commission from foreign rulers, such as the French king, Louis XV - the serenade La Sena festeggiante (Festival on the Seine), for example. This work cannot be dated precisely, but it was certainly written after 1720. Earlier, in the 1660's, musical life in Rome had been enormously stimulated by the presence in the city of Christina of Sweden. The "Pallas of the North," as she was called, abdicated from the Swedish throne in 1654. A few years later she moved to Rome and took up residence in the Palazzo Riario. There she organized musical events that were attended by composers such as Corelli and Scarlatti. Other composers, too, such as Geminiani and Handel worked in Rome for periods of time. Like them, Vivaldi profited from the favourable cultural climate in the city. Despite his stay in Rome and other cities, Vivaldi remained in the service of the Ospedale della Pietà, which nominated him "Maestro di concerti." He was required only to send two concertos per month to Venice (transport costs were to the account of the client) for which he received a ducat per concerto. His presence was never required. He also remained director of the Teatro Sant' Angelo, as he did in the 1726, 7 and 8 seasons. Between 1725 and 1728 some eight operas were premiered in Venice and Florence. 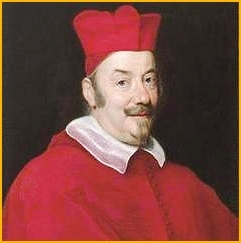 Abbot Conti wrote of his contemporary, Vivaldi: "In less than three months Vivaldi has composed three operas, two for Venice and a third for Florence; the last has given something of a boost to the name of the theater of that city and he has earned a great deal of money." Between 1725 and 1728 Vivaldi was also extremely active in the field of concertos, encouraged, perhaps, by the establishment of improved engraving and distribution facilities in London and Amsterdam. In 1725 the publication Il Cimento dell' Armenia e dell'invenzione (The trial of harmony and invention), opus 8, appeared in Amsterdam. This consisted of twelve concertos, seven of which were descriptive: The Four Seasons, Storm at Sea, Pleasure and The Hunt. Vivaldi transformed the tradition of descriptive music into a typically Italian musical style with its unmistakable timbre in which the strings play a major role. These concertos were enormously successful, particularly in France. In the second half of the 1700s there even appeared some remarkable adaptations of the Spring concerto: Michel Corrette (1709-1795) based his motet Laudate Dominum de coelis of 1765 on this concerto and, in 1775, Jean-Jacques Rousseau reworked it into a version for solo flute. "Spring" was also a firm favourite of King Louis XV, who would order it to be performed at the most unexpected moments, and Vivaldi received various commissions for further compositions from the court at Versailles. In 1730 Vivaldi, his father, and Anna Giraud travelled to Prague. 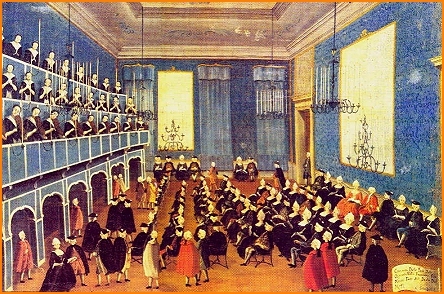 In this music-loving city (half a century later Mozart would celebrate his first operatic triumphs there) Vivaldi met a Venetian opera company which between 1724 and 1734 staged some sixty operas in the theater of Count Franz Anton von Sporck (for whom incidentally, Bach produced his Four Shorter Masses). In the 1730-1731 season, two new operas by Vivaldi were premiered there after the previous season had closed with his opera Farnace, a work the composer often used as his showpiece. At the end of 1731 Vivaldi returned to Venice, but at the beginning of 1732 he left again for Mantua and Verona. In Mantua, Vivaldi's opera Semimmide was performed and in Verona, on the occasion of the opening of the new Teatro Filarmonico, La fida Ninfa, with a libretto by the Veronese poet and man of letters, Scipione Maffei, was staged. After his stay in Prague, Vivaldi concentrated mainly on operas. No further collections of instrumental music were published. However Vivaldi continued to write instrumental music, although it was only to sell the manuscripts to private persons or to the Ospedale della Pietà, which after 1735 paid him a fixed honorarium of 100 ducats a year. In 1733 he met the English traveller, Edward Holdsworth, who had been commissioned to purchase a few of Vivaldi's compositions for the man of letters, Charles Jennens, author of texts for oratorios by Handel. Holdsworth wrote to Jennens: "I spoke with your friend Vivaldi today. He told me that he had decided to publish no more concertos because otherwise he can no longer sell his handwritten compositions. He earns more with these, he said, and since he charges one guinea per piece, that must be true if he finds a goodly number of buyers." In 1738 Vivaldi was in Amsterdam where he conducted a festive opening concert for the 100th Anniversary of the Schouwburg Theatre. Returning to Venice, which was at that time suffering a severe economic downturn, Vivaldi at last resigned from the Ospedale in 1740, planning to move to Vienna under the patronage of his admirer Charles VI. His stay in Vienna was to be shortlived however, for he died aged 62 on July 28th 1741 "of internal fire" (probably the asthmatic bronchitis from which he suffered all his life) and, like Mozart fifty years later, received a modest burial. Anna Giraud returned to Venice, where she died in 1750. 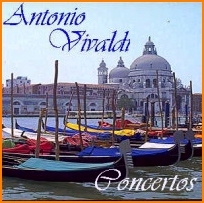 Vivaldi's music became widely known, and performed, throughout Europe, due in large part to his publications with Estienne Roger of Amsterdam, whose distribution was well-organized. He had, for example, a distributor in Leipzig with whom Bach was in regular contact. Bach indeed adapted a number of Vivaldi's works for organ and harpsichord, and as concertos for harpsichord and strings. 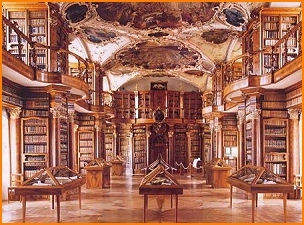 He also included several of Vivaldi's works during the popular musical evenings which he organised during the 1730s at Zimmerman's Coffee House in Leipzig. 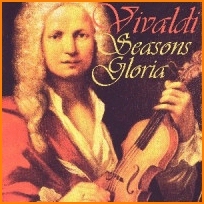 Today Vivaldi is perhaps best known for his Four Seasons. However students of individual orchestral instruments can be sure of finding challenging pieces which Vivaldi composed for his own students at the Venice Ospedale. Music publishing in Baroque Europe. Two major publishers in London, developing new and cheaper methods of engraving and printing. Antonio Vivaldi: his music "rediscovered"
one of baroque Italy's famous violin makers. 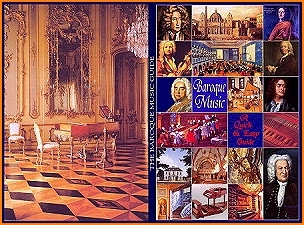 offers a wealth of information on all aspects of baroque music.